How can you divide a space? 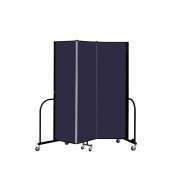 Portable partitions offer an affordable and convenient way of creating instant office or meeting spaces. 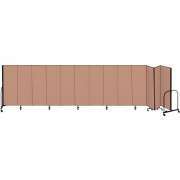 If you want to temporarily divide a large room into sections, folding room dividers are the way to go. This convenient solution enables you to arrange new spaces without the expense of construction. 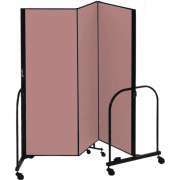 Portable room dividers come in a variety of heights and lengths. Hertz Furniture&apos;s high-quality selection is designed for safe, user-friendly convenience. 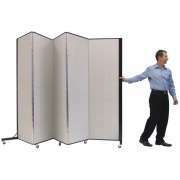 Portable partitions are even great to have around “just in case”. Do I need room dividers? Any church, business or school can benefit from a great space-dividing solution. Especially if your institution has large open spaces, it is convenient to have an easy way of splitting them up when necessary. 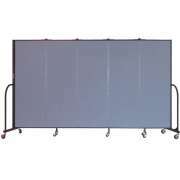 Dividers are useful for information expos, seminars, temporary meeting spaces and much more. Should I get permanent or portable partitions? 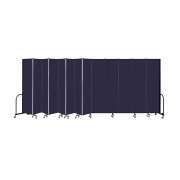 Our selection of portable partitions includes many different lengths. Length varies based on the number of panels in the unit and their widths. In order to determine the right size room divider for your purposes, you should measure the space that you want to divide up and think about how you want to arrange it. 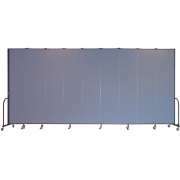 If you want to use your dividers in a number of different rooms or configurations, or you are not quite sure exactly what you need them for, you can always order a configuration that is a bit longer and keep the extra panels neatly folded up at the end when you don&apos;t need them. 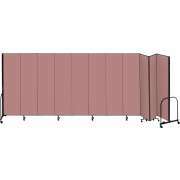 Portable room dividers give you more flexibility than similar units that are permanently positioned. They can be moved from room to room as needed and whisked out of the way when you want a large open space. 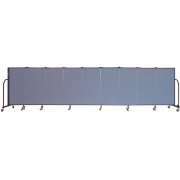 The foldable partition arrangement is convenient if you are having a conference with smaller sessions and larger groups but don&apos;t have enough separate spaces. In a case such as this one, you can simply divide the spaces for small meetings and open them up in seconds to create a larger space. Can I hang things up on a wall partition? 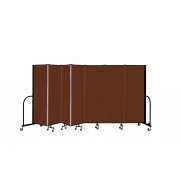 Portable partitions don&apos;t just separate spaces, they can also be used as display panels. 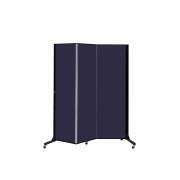 We have mobile display towers which are great for student artwork displays and science fairs. 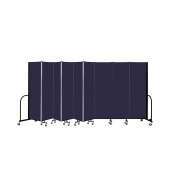 Many of our regular portable room dividers can be used for display purposes as well. 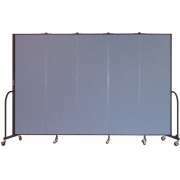 Vinyl or polyester surfaces let you hang up posters or important information with tacks or velcro. 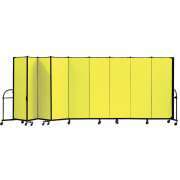 What kind of portable wall partitions should I get? There are a number of additional conveniences that are offered with room partitions. A huge selection of upholstery colors lets you match your dividers to any space or color scheme. You don&apos;t have to worry about conference participants becoming distracted by the simultaneous session next door. Many of our wall partitions are rated for a high degree of sound absorption, which truly creates the feel of separate rooms. Additionally, they are built for safe stability. 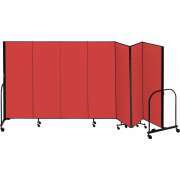 If you are looking for something unique, our specialized room dividers come with a host of extra options. We offer models with a whiteboard or built-in storage cabinet so you don&apos;t have to compromise on classroom furniture in your temporary rooms. Specialized individual panels from Wood Designs are perfect for dividing up preschool learning centers. They come in pegboard, acrylic, markerboard and flannel surfaces which serve the dual purpose of dividing up spaces and providing a source of further activity and creativity. 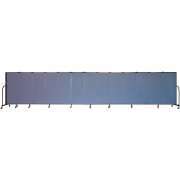 Need a custom solution for dividing up space in your school, church or offices? Customfold Panel Partitions are designed just for you and your unique needs. These specially-ordered dividers have a number of excellent options that are configured for your particular space. Hertz Furniture has the portable partitions you need to divide up a room in a classy and professional way. 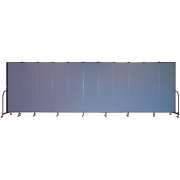 Our selection of sizes and styles includes folding room dividers that will look great in any space or setting, be it professional, educational or religious. 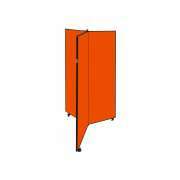 We have Screenflex portable partitions, as well as options from other reliable manufacturers. If you need help figuring out the best choice for your institution, contact the Hertz Design Center for free project-planning advice.